Nurture Life is a subscription service that prepares wholesome, nutritious, ready-to-eat meals for babies, toddlers and kids and delivers them weekly, straight to your door. How does Nurture Life work? Provide your kids’ ages and dietary preferences and our culinary team will start cooking up your weekly order. Go with our Chef’s Choice Menu or select your meals from our Seasonal and Favorites menus. Menus change weekly so that your kids can experience a variety of tastes to expand their palates. You can change your meals, skip weeks or pause your account as long as it’s before the order cutoff date and time. A week’s worth of meals are delivered straight to your door in an insulated box to maintain freshness. If you’re not home when they’re delivered, meals stay chilled until you can put them in the refrigerator later that day. All our meals are made-to-order and arrive cold but never frozen. Meals are delivered ready-to-eat. When your kids are ready, just warm in your microwave or oven and serve. All meal labels include heating instructions, use by dates and full ingredient lists. Click here to get started. Start by entering your zip code to confirm that we deliver to your area. If we do, you’ll be prompted to tell us about your kids’ ages and dietary preferences and proceed through the sign up process. If we are not delivering to your area yet, please enter your email address and we’ll let you know as soon as we are. What meal plans do you offer? For Baby Stage 1, 2 and 3, we offer plans with 8 and 14 meals per week. For Toddlers and Kids, we offer plans with 5 and 10 meals per week. Meals can be used interchangeably for lunch and/or dinner. How much do Nurture Life plans cost? Nurture Life meals are priced by stage / age, portion size and number of meals per week. Shipping is $6 per plan and a maximum of $12 for two or more plans. Does Nurture Life work for picky eaters? Many of our customers have children who they consider picky eaters. Nurture Life is a great way to expose picky eaters to new tastes to help expand their palates. If your child is a picky eater, we suggest starting with selections from our Favorites Menu, which are our healthier versions of classic kids favorites. Then, we suggest gradually incorporating our seasonal meals to expose your child to a wider variety of flavors. We have worked with our pediatric dietitian to specifically develop some strategies and meals for picky eaters. Here is a link to some more information. Who creates Nurture Life meals? All Nurture Life meals are created by our culinary team in collaboration with our pediatric dietitian to ensure meals meet the changing nutritional needs of growing kids while introducing them to new flavors and textures. We create all of our meals based on the USDA MyPlate guidelines, consistently offering a wide variety produce, protein and starches. All ingredients are sourced from the best farmers and purveyors, and meals are prepared, cooked and packaged in our commercial kitchen in the heart of Chicago. Meals are shipped cold, never frozen, straight to your door. All of our ingredients are organic whenever possible. We take great effort to partner with farmers and purveyors who provide organic ingredients. All of our meats are all-natural, antibiotic-free, no growth-enhancing drugs, vegetable-fed and animal-welfare rated, we use fresh caught and sustainably farmed seafood with MSC, BAP or ASC certification, our produce is local, fresh and in-season whenever possible and our ancient and heirloom whole grains and legumes are sourced from trusted purveyors to use in our globally-inspired meals. How do I prepare Nurture Life meals once they arrive? Nurture Life meals are delivered ready-to-eat. Most meals are best served heated while others can be served cold. All meals that require heating can be heated in the microwave or oven and include full heating instructions on the meal label. Are your containers microwave and/or oven safe? For our baby meals, our jars and lids are not microwave and oven safe. If you are planning to heat, please transfer the purees or finger foods to a heat-safe container for warming. Always refer to the label on your jar for specific safe handling instructions. For our toddler and kids meals, trays and seals are microwavable, and we recommend piercing or gently breaking the seal before heating. Trays are oven safe up to 325 °F . For heating in the oven, remove the seal entirely and cover the meal with foil. Always refer to the label on your meal for specific safe handling instructions. How long can I keep a Nurture Life meal in the refrigerator? Our meals stay fresh for 5-7 days depending on your delivery day. All our meals include use by dates on the meal labels. Can your meals be frozen? Our meals can be frozen for up to 90 days as long as it’s before the use by date, which is stated on the meal label. To defrost, simply place in the refrigerator overnight to thaw. This may take anywhere from 18-24 hours for our toddler and kids meals and 12-18 hours for our baby meals. Are Nurture Life meals safe to consume past their use by date? All our meals are perishable and must be refrigerated immediately. Meals should not be consumed past their use by date, which is stated on the meal label. Do you offer vegetarian meals and meal plans? Yes! Our vegetarian meals are designed for lacto-ovo vegetarians or those who include egg, milk, cheese, yogurt and other milk and egg containing products in their diets. Our vegetarian meals do not contain any meat, poultry, seafood or fish. All of our vegetarian meals are indicated with a V.
What ingredients do you use in your vegetarian meals? We highlight a variety of protein-packed ingredients including eggs, tofu, legumes (beans, peas and lentils) and other vegetable derived proteins such as seitan. Additionally, we include protein-dense whole grains such as farro, quinoa, millet and whole wheat pasta. Do you offer vegan meals and meal plans? We do offer vegan options, but do not offer vegan meal plans at this time. Our vegan meals are designed for children who do not eat any animal proteins or products that come from animals such as milk, eggs, honey and gelatin. While we do offer vegan meals, they are limited, but we hope to expand these offerings in the future. All of our vegan meals are indicated with a VN. What ingredients do you use in your vegan meals? Similar to our vegetarian meals, our vegan meals include a diverse variety of whole grains and plant proteins. However, these meals do not include any animal derived ingredients. We do offer gluten-free options. All gluten-free meals are tagged with a GF on our subscription site. Please note that our gluten-free meals are processed in the same facility as our non gluten-free options. If your child has a severe gluten allergy, Nurture Life may not be the right option for you. Please contact us if you have any questions about your specific needs at support@nurturelife.com or 877.988.8851. What if my child has a food allergy? We recommend that you closely review meal descriptions and ingredients if your child has a food allergy. All our meals and meal labels include full ingredient lists. Please note that all of our meals are made in a facility free of peanuts, tree nuts (except coconut) and shellfish. The facility does contain coconut, dairy, eggs, fish, soy and wheat. If your child has a severe gluten allergy, Nurture Life might not be the right option for you. Please contact us if you have any questions. How do I change my child’s meal plan? Please note that if you change a meal plan after you’ve made specific changes to your upcoming meals, all of your meal choices will reset to the Chef’s Choice menu for your newly selected plan. What is the weekly cutoff date and time to change my meals or skip a week? The deadline to change your meals or skip a week is dependent on your delivery day. In your account, from the My Meals page, when you click on a week you will see the order cutoff date and time in the upper right hand side of your screen. You will also receive a reminder email three days prior to the order cutoff date and time each week reminding you to make changes or skip a week. How can I change or add meals on your website? Sign in to your account and follow the steps below. Click View / Edit next to the week you want to change. Click Change / Add for the child you want to change. Click – or x to remove meals. Click + to add meals. Confirm your changes by clicking the Confirm Changes button at the bottom of the screen. How can I change or add meals on a mobile device? From the My Meals tab across the bottom, select the order you’d like to make changes to. Select the plan you want to make changes to. Click + or – to add or remove meals. Click the red CONFIRM button. Review your order and click the green CONFIRM button. You will then see a pop-up confirming your changes. How do I view my current and past orders? Sign in to your account and go to My Meals. From there you can view Upcoming Meals and Your Past Orders. Click on “View / Edit” to review Upcoming Meals. Click on “View Order” to view Past Orders. Can I skip a week? Absolutely! Simply sign in to your account and go to My Meals. Select the week of Upcoming Meals that you’d like to skip and click on “Skip This Week.” If you have a Nurture Life subscription for more than one child, you can skip a week for just one child. 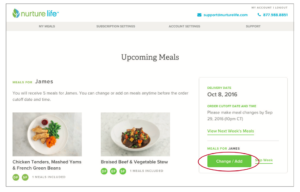 The deadline to skip a week is your weekly order cutoff date and time, which can be found in the upper right hand corner of your screen on all Upcoming Meals pages. Orders that show “Your order is confirmed” are past the order cutoff date and time and cannot be skipped. You will be responsible for the charges associated with a confirmed order. Yes. To pause your subscription, sign in to your account and click Subscription Settings in the gray banner across the top. Next, scroll down and click Pause for the child you’d like to pause. You can pause one or multiple children. You will be able to select the delivery day that you would like to resume your subscription. When your subscription resumes, we will send you an email reminding you that your subscription has resumed. Can I add meals for any age? Go to My Meals and click on the week’s meals you’d like to add to your current order. Click the Change/Add button under Meals for Any Age. Click on the + under the category of meals you’d like to select from. Click on the + again to add it to your week’s meals. After you’ve finished adding meals, click Confirm Add Ons to complete your order. You should see a Success pop-up after confirming. Click OK to return to your week’s order page. Can I rate my meals, mark them as favorites or add comments? How do I cancel my Nurture Life subscription? Subscriptions can be canceled by contacting customer experience at support@nurturelife.com or 877.988.8851. If you have multiple subscriptions and would like to cancel one (but not all) of your subscriptions, you can do so at any time by signing in to your account and clicking Subscription Settings in the gray banner across the top. Then, scroll down to the subscription you’d like to cancel and click Remove. Alternately, you can pause your subscription. You can re-subscribe at any time by signing in with your email address and password. We process the charge immediately following the cutoff for your order which falls anywhere from 6-8 days prior to your delivery. The cutoff is specific to your delivery day and time zone. When logged in on a desktop the cutoff can be found at the top of your order summary. On a mobile device it is located on the My Meals page under the delivery date when clicked. What kinds of payment does Nurture Life accept? We accept Visa, MasterCard, American Express and Discover. We do not accept personal checks or money orders. Yes! All Nurture Life customers have access to our Refer A Friend program. You can invite new families via email, Facebook and Twitter. To invite a new family to try Nurture Life, sign in to your account and click on Refer A Friend on the gray bar across the top of the screen. Then follow the steps to refer a friend. Your friends will receive $20 off their first order. For every new friend you invite who subscribes for one week or more, you will receive a $20 credit towards your next order. You can earn an unlimited amount of credits. From the Refer A Friend section in your account, you will also be able to track your invites to see if your friends have claimed their Nurture Life subscription. If they haven’t, you can resend the invite to remind them to try us out. You can update your default address or add a new address by going to your Account Settings and selecting “Edit Info” under Shipping Info. If you have special delivery instructions, such as “leave our box with the doorman,” please let us know in the Delivery Instructions field. Can I have more than one shipping address on file? Your order should arrive by 9pm on the specified delivery day of your order. You will also receive an email notification with tracking information once your order has shipped. If you aren’t home to receive your delivery, our shipping provider will generally leave your package at your doorstep, with a doorman or in a packaging room, as applicable. Since our meals are packaged to remain cold for a minimum of 48 hours, they should remain cold and fresh until you return home and can place them in the refrigerator later that day. If you have special delivery instructions, such as “leave our box with the doorman,” please let us know by updating your delivery instructions. Sign in to your account, click on the Account Settings tab, scroll down to the Shipping Info section, click on the “Edit Info” button then enter in your Delivery Instructions. Will my food stay fresh in transit? To keep your meals cold and fresh throughout their journey to your door, we use a thermal liner made of 100% recycled material and pack each box with non-toxic, non-hazardous gel packs. Our packages are designed to stay at or below 41 degrees Fahrenheit until their arrival to you. As our meals are perishable, please place them in the refrigerator as soon as you receive them to ensure maximum freshness. What should I do if the gel packs are melted and/or meals are warm upon arrival? Our packages are designed to keep our meals at or below refrigerated temperature (41°F) for a minimum of 48 hours. When you receive your package, if the gel packs are melted and/or the meals are not 41°F or below please contact our customer experience team and we would be happy to assist you. Are your meals shipped frozen? All of our meals are shipped cold on purpose, but never frozen. Can I change my delivery day? We do offer multiple delivery day options depending on your zipcode. To find out which delivery days are available for your zipcode and to change your delivery day please contact us at support@nurturelife.com or 877.988.8851. Our shipping charge is $6 per meal plan. If you have two or more meal plans the maximum shipping charge is $12. All of our packaging is recyclable except for the interior of our gel packs. To dispose of our gel packs, we recommend cutting them open, discarding the interior, which is a non-toxic, non-hazardous, food-safe gel, and recycling the exterior. Our gel packs can also be refrozen and reused. What are your gel packs made of? The gel packs are made of water and sodium polyacrylate. They are non-toxic, non-hazardous and food-safe. Are your gel packs recyclable? The sleeve of the gel packs are recyclable but the interior gel is not. To dispose of the gel packs, please cut the sleeve and dispose of the interior gel in the trash and recycle the sleeve. If you do not wish to dispose of the gel packs, they can also be refrozen and reused.